In summer 2017, the America Nepal Society (ANS) joined the Prince William County Soil and Water District Water Quality Monitoring program under the Virginia Save Our Streams Program. ANS has adopted the Dewey's Creek in the Town of Dumfries in Virginia for water quality monitoring to determine stream health and the impact of pollution in the nearby communities. 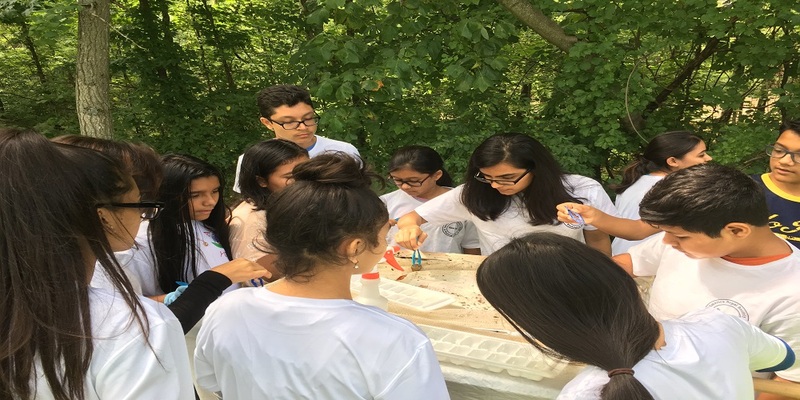 This partnership with the District has given ANS a unique opportunity to serve the communities in organizing stream cleanup events and to allow its students to gain hands on experiences in the field of science by conducting biological and chemical monitoring. The kids are learning to classify benthic organisms and learning how they determine water pollution following their specific sensitivity. Results from the chemical test components such as pH, turbidity, nitrate, phosphate and e-coli are helping the students learn how humans affect water quality in local streams. This has helped American Nepal Society (ANS) members become more attentive to the state of the streams in Northern Virginia. This is leading to the modification of behaviors as well as the behaviors of families, friends and neighbors in order to promote and improve water quality in Northern Virginia communities. ANS has gained so much knowledge from these events. The Group has become a increasingly aware of the importance of water quality and is now a growing voice in their communities in the United States as well as beyond with friends and family back in Nepal. We hope other organizations and groups in Prince William County can follow this outstanding example by America Nepal Society that promotes the County's Green Community Goals. Editor’s Note: Veronica Tangiri is the Water Quality /Adopt-A-Stream Coordinator for the Prince William Soil and Water Conservation District.